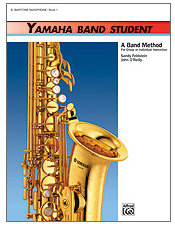 Yamaha Band Student will appeal to teachers looking for a well-paced lesson sequence that keeps students motivated to continue past the first critical year. It is affordably priced, attractively presented and meets the needs of today's students and educators. Each level includes numerous songs, duets, trios and four full-band arrangements right in the method itself--perfect for first-year concerts.